Community Mural Project: This 2nd grade project allowed students to connect to their school community by collaboratively making a mural symbolizing their school. Look HERE for the full lesson and documentation! Nylon Non-Objective/Abstract Sculpture: 3rd grade students were able to build and design their own abstract or non-objective sculptures out of wood, wire, nylon, glue and paint. . Look HERE for the full lesson and documentation! Steampunk Creatures: Students at the LAB school had the opportunity to put on their inventor’s caps! They deconstructed recyclable materials such as computer parts, keyboards, bike gears, wires, cans and old utensils. Then they created a new creature out of all the collected parts. Look HERE for the full lesson plans, or visit the full site dedicated to this semester of learning! Overview: Students explored nature inspired Jewelry by learning about artists David Freda, Sarah Hood, and Maori tribal jewelry. 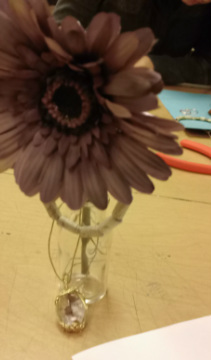 They learned multiple techniques that incorporate nature or can imitate nature such as resin casting natural found objects, wire wrapping to look like vines, and making beads out of grass. Look HERE for the full lesson and student examples. 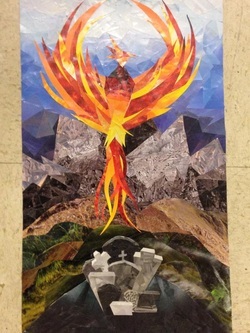 OVERVIEW: This lesson was pertinent to building understanding about principles of design, gave students a new material to work with that wasn't threatening, built skills of persistence, and they told their own personal story about their past, present, or future using symbolism. Look HERE for the full lesson and more student examples. Overview: Painting I students began exploring different acrylic techniques, and then painted a non-objective painting that represented themselves. They did this by selecting two colors that best represented their personality from a "what color are you?" worksheet and using those as the main colors in their piece. They wrote down 7 of their personality traits and used different paint application to demonstrate those traits.